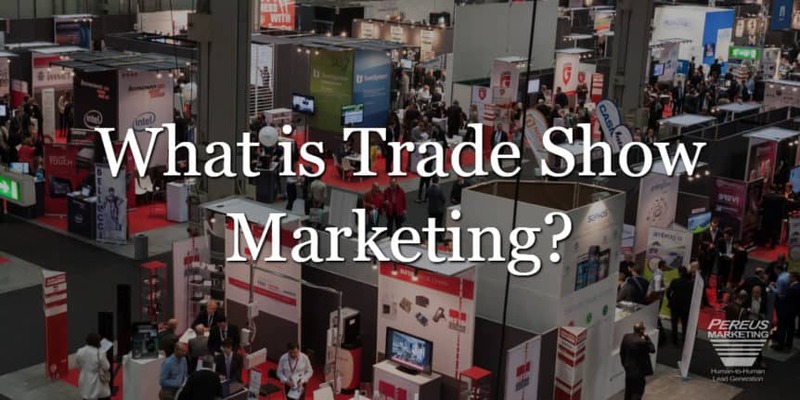 Blog What is Trade Show Marketing? Trade shows — at conventions, expos or fairs — give you the opportunity to meet potentially hundreds of new clients, all in one place. It’s the ultimate cold-calling adventure, in that you’re meeting strangers with the intent of developing a business relationship. You may think that trade show marketing is as simple as just showing up, but it actually requires extensive planning to yield the best results. Usually, the professional groups that put on trade shows can provide lists of all the companies that are expected to attend, both as exhibitors and as attendees. For B2B trade show marketing events, these lists help promote every show; some companies are particularly invited. Organizers of B2C trade shows also maintain lists and may provide them with their pre-show marketing opportunities. Sending emails to the list inviting them to your booth. Printing and mailing postcards with a similar invitation. Everyone who returns the postcard or registers a QR code at the booth gets a prize. All who respond to your invitation are entered in a drawing. Everyone who visits your booth in response to the invite gets an extreme discount. Setting appointments with potential clients attending the show. Meet for lunch, an after-show drink or even a sit-down at your booth. Sending out another invitation as the trade show date approaches. Share speakers you recommend, parties not to miss and other interesting tidbits about the show or its destination city. Keeping your website updated with show information and blogs about the event, including any deals you’ll make available at your booth. Offering to do a workshop or speak at a breakout session to increase your exposure. These spots typically are arranged well in advance of the show, so contact the show’s organizers as early as possible. Early registration and advance planning give you a wider choice of locations for your booth. Choose one that’s near the beer tent or within sight of the entrance. An inviting, interactive exhibit draws attention, too. While you need to get your booth ready for the show, order all your giveaways and arrange for your travel and lodging, make sure you bring the right team with you to man and support your booth. Rely on marketing staff who understand the value of building relationships. They more smoothly move potential clients toward sales. If you leave the best trade show marketing staff behind, the sales staff often comes on too strong to every visitor. Conversely, companies sometimes leave the booths to administrative staff members who may not be particularly adept at building relationships or providing sufficient information. Consider a mix of talents — including the business owner, CEO, tech experts or others who can answer questions and show off your company’s best assets. It’s always nice to close a sale (or two or three) at an event, but a truly effective trade show marketing strategy involves more long-range thinking. You and your team can focus on building a reputation and flaunting your features if you make collecting information your goal. Then you can follow up later, when a sale is much more likely to take place. Set a fishbowl on a table in your booth for visitors to drop in their business cards. Create interest with raffles. Then use the PA system to call out winners every hour or so, pulled from your fishbowl. Offer a bigger prize at the end of the show that participants don’t have to be present to win. This prize also comes from a pulled fishbowl card. Offer interesting games — like a putting green, dart board or a computer animation — that draws attention, gives attendees something fun to do and requires contact information before play. After the event, the heavy lifting portion of your trade show marketing strategy really kicks in. As you pack up your booth, treat those business cards and contact information like the gold they are. After your positive impression at the trade show, cold-calling these businesses won’t be cold at all; they’ll be much warmer toward a sale. If your sales team is busy closing those hot leads they gathered at the show, rely on the firm that organized your pre-show marketing. Let a firm like Pereus Marketing pick up after the show while you get back to business. Remember how important this kind of post-show follow-up activity is to your trade show success. Whoever takes over the follow-up contacts, get it done quickly. Prospects tend to move on after a trade show. They may stick your pen in their pockets or your mug on their desks, but they may still hire the firm that calls and thanks them for visiting the booth at the show. Establish a positive relationship. Cementing your name in the minds of your prospects. Creating the impression that your company truly appreciates its customers. Providing an opportunity to remind prospects of trade show deals that may still be available. Giving you time to set up personal meetings where you have more time to answer questions and make presentations. Updating your database of contacts that you can continue to reach out to, while eliminating those trade show visitors who really have no use for your offerings.